U.S. Immigration and Customs Enforcement announced Monday night that they will begin the process of releasing about 2,000 women and children who have been detained for more than a year at two federal immigration detention facilities in South Texas. ICE said that going forward it “will not generally detain” mothers with children. 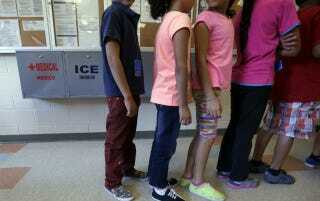 The families being held are mostly Central American and seeking asylum in the United States. In April of this year, 78 women being held at one of the facilities, the Karnes County Residential Center, staged a hunger strike, saying their asylum pleas weren’t being heard in the court set up for the process, and that the facility was, for all intents and purposes, a prison. At least two of the hunger strikers were reportedly placed in isolation as punishment, along with their children. One Honduran migrant mother told the Guardian that the other facility, Dilley Detention Center, was “soul-destroying.” She watched her toddler daughter grow ill, but was penniless and unable to afford the $5,000 bond ICE demanded for her release. According to a McClatchy report, the women and their children are being dropped off at bus stations in South Texas. The women will be monitored with ankle bracelets.